Wherever God is continuously remembered becomes a place of intensified spiritual power. Such places are many at Gobind Sadan’s communities. They have all been developed and blessed by the spiritual vision and power coming through His Holiness Baba Virsa Singh. Spontaneous and regular worship continues around the clock at all these sacred locations, and at other private places in Gobind Sadan as well. Thus when one enters Gobind Sadan, one immediately finds oneself in a different world. For Sikhs, the holy scripture, Guru Granth Sahib, is the most revered of living spiritual teachers. It was given this position by the Tenth Sikh Guru, Guru Gobind Singh, before he passed away. It embodies his universal spiritual ideal, for it contains many inspired hymns about God from Hindu and Muslim saints as well as Sikh Gurus. It is treated as a most holy living Being, placed on soft pillows under a regal canopy and wrapped in beautiful cloths. Devotees take turns reading from it continuously at Gobind Sadan, while others wave whisks reverently above it. 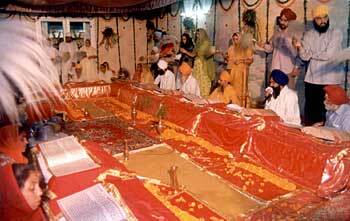 The atmosphere within the “court” of the Guru Granth Sahib is kept very pure. On entering Darbar Sahib and bowing before the scripture, one is struck by this purity and the power of the living Presence. Lights, candles, or fire are used in all religions to remind people of the Light of God, which dwells within us all and invisibly permeates all of Creation. His Holiness Baba Virsa Singh has been instructed to build havans –sacred fires–in all of his communities. In these seven-sided fire pits, devotees offer ghee (very pure clarified butter oil) and samagri (a mixture of grains, dried fruits and flowers, and ghee). They are etherealized by the fire, and their fragrance is thought to be pleasing to the invisible Presences whose blessings are being sought. Around the clock, devotees sit in the havans reciting Jaap Sahib or Nam, creating an atmosphere of intense devotion in which miracles of healing, answered prayers, and inner transformation often occur. Havan is also a powerful place in which to confront and do battle with one’s own inner darknesses, surrendering them to the Light of God, as represented by the fire. Many people also find it beneficial to wash the floor of the havan while reciting Nam, the mantra that His Holiness offers to anyone who wants it: “Ik Onkar Sat Nam Siri Wahe Guru–God is One, God is Truth, worthy of greatest reverence, ineffably wondrous Master.” As they wash the floor while reciting Nam, their minds are also cleansed of worries, fears, and negative thoughts, and they emerge with a sense of great inner peace. 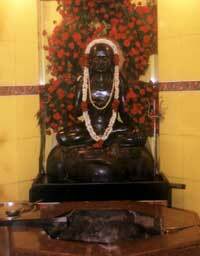 Baba Siri Chand is the elder son of Guru Nanak, the first Sikh Guru. He began appearing to Baba Virsa Singh in vision when he was a child and has continued to instruct him, along with Guru Gobind Singh, the great tenth Sikh Guru. 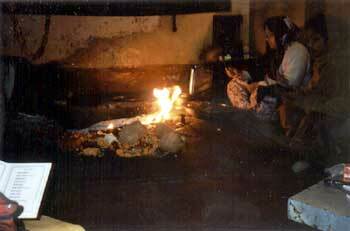 Since the early days of Gobind Sadan in Delhi, a small havan has been maintained in memory of Baba Siri Chand. 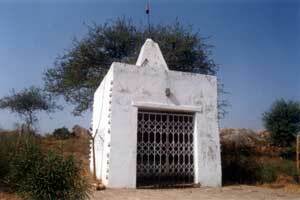 His Holiness Baba Virsa Singh used to pray there every morning and wash the place himself. Now a statue of Baba Siri Chand has been installed there, and it is lovingly washed every morning at 1:30 a.m. before the day’s devotions begin at 2 a.m. Baba Siri Chand is Gobind Sadan’s model of a life of intense spiritual devotion combined with living amongst the people, working hard to help them, rather than escaping from the world. The water which has been used to wash Baba Siri Chand’s statue is carefully collected each morning and kept in an urn next to the havan. Devotees drink this holy water or rub it on themselves, for it is blessed with healing energy and is also known to deepen one’s meditation. In 1984, when His Holiness Baba Virsa Singh was at the home of a devotee in Delhi, he had such a memorable vision of Jesus that he ordered first a rock, and then a statue to be erected at the place behind the dairy where he had seen Jesus. He explains, “Jesus’s Place has not been constructed with the intention of pleasing anybody. Rather, it is the site of a special event. One day, when Gobind Sadan was facing many problems, I was sitting on a sofa in Swaranjit Singh’s house, feeling very serene and joyous. My mind was a state which was neither asleep nor awake. Great rays of light awoke me and in a vision drew my attention to this place. Jesus was standing here with his arms outspread. Speaking loud as thunder, he said, ‘Blesssssss!! !’ His voice seemed to echo throughout the cosmos. At that time, this place was covered with manure, for it was behind the mangers where the animals were fed. For an hour and a quarter, Jesus kept blessing and speaking about the problems which were weighing on my mind. Just by his words, they were all resolved. Those blessings include many healings and cases in which countless childless couples have been blessed with babies. Over the years, more blessings have been given for Jesus’s Place, and many people who are not Christians have seen Jesus or felt his presence there. Jesus has told Baba Virsa Singh, “Everyone who comes here will receive something. No one will go away empty-handed.” Lovely gardens and grassy lawns have been built around the statue, and visitors find themselves in an oasis of peace and natural beauty. Babaji has said that those who place water at Jesus’s feet, sit there for ten minutes reciting Nam, and then drink the water will experience healing. Sweet and pure water now trickles from the stones at Jesus’s feet, disappears into the ground, and reappears in a shady stone grotto behind the statue. Babaji has given great blessings for the healing power of this water. The first person to test it rubbed some of it on his face, for he was in great pain from longlasting sinus congestion. At once, the pain was gone. Babaji has said that if a person has an illness which doctors cannot cure, he can pray before Jesus for healing, promising to distribute punjiri (a delicious home-made sweet offering) of such-and-such quantity once he is healed. Once he is healed, he is expected to fulfill the promise to Jesus. Another boon has been given for those who are facing seemingly insolvable difficulties. 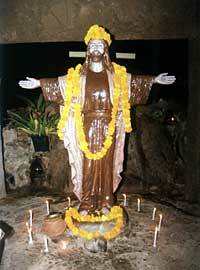 Babaji says that if they light seven candles around Jesus for seven days, their problems will be removed. Beautiful glass houses have been placed around the statue to protect candles from the wind. Daily, many people of all religions visit Jesus’s Place to offer flowers, light candles, offer incense, and to pray before Jesus. In the summer, a fan circles above his head to keep him cool; in the winter, devotees lovingly put shawls and even mittens on him so that he will not be cold. Jesus’s Place exudes such an attractive, magnetic atmosphere that people leave only reluctantly. Even sceptics and atheists find themselves drawn there again and again. The new mosque–Just behind Jesus’s Place, facing Mecca across a rocky ridge, a place for Namaz (Muslim prayer) is being built in traditional Muslim style. It is being built near Jesus’s Place, “for Jesus and the Prophet Muhammad are brothers,” explains His Holiness Baba Virsa Singh. In addition to providing a special place of prayer for Gobind Sadan’s Muslim community, people of all religions join in the daily prayers in remembrance of the One God Whose Names are many. From time to time, there will be readings from the Holy Qur’an in Arabic so beautiful that one weeps to hear it. Five mandirs to specially loved deities have been placed on the rocky ridge along Gobind Sadan’s western boundary. They contain traditional statues of Krishna and Radha, Ram and Sita, Shiva and Ganesh, Kali Mata, and Hanuman. Trees are being carefully nurtured along the path from one mandir to the next so that someday, by the grace of God, it will be a shady lane. Already some visionary people have reported extraordinary experiences at the mandirs.